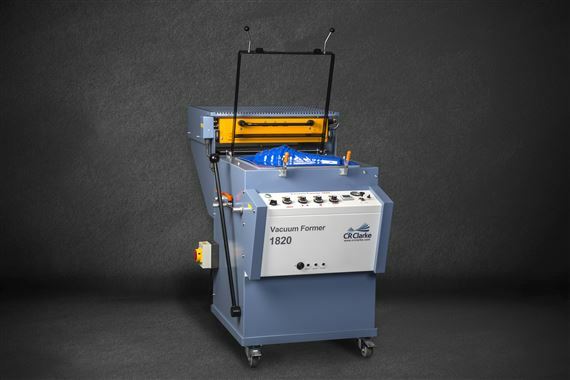 The CR Clarke CR1820 vacuum former is a flexible workhorse. With a huge 285mm depth of draw, and the largest forming area in our range, it's a formidable beast. Capable of processing 8mm thick sheet, it's the ultimate workshop tool for plastic forming. 240V, single phase. Our CR Clarke CR1820 has been developed for high performance, ease of use and low maintenance. The machine is fitted with a dual rocking head vacuum pump assembly that generates -0.83 Bar, and also provides a blow release facility to aid removal of the completed forming. The ceramic heater system heats all thermoplastic materials quickly and evenly. Four individual heating zones with panel controls allow fine-tuning of heat distribution. The cantilevered heater hood allows material to be sheet or roll fed, and the platen runs on chrome plated slides with nylon bushings for smooth operation. The material seal is custom manufactured from RTV silicone as a one-piece gasket, and the platen seal simply lifts out for easy replacement. The machine has a digital timer with an audible alarm, assisting the operator to heat the material to the correct state on each forming. The CR Clarke CR1820 is a freestanding unit with lockable castors for ease of movement in the workshop.